Bob’s Burgers has often payed tribute to Steven Spielberg’s specific brand of summer-vacation nostalgia with spoofs of The Goonies (“The Belchies”), E.T. (“O.T. : The Outside Toilet”), Jaws (“The Deepening”) and now probably the least well-known Spielberg joint, Duel. Once that candy cane truck flicked on its lights and started gunning for the Belcher station wagon, what had until then been a standard Christmas episode kicked into high-octane gear. Add in Linda’s pursuit of a Dutch Baby (only took 22 minutes to make!) and Gene running down the batteries on the family phone trying to request a song on the radio, this episode manages to add enough chaos to be an episode of Bob’s and yet also treat a candy cane truck as a very real adversary. Bob: Bob plays the straight man for most of this episode, but his despair (especially when it’s about the danger of his Christmas ham meeting the same fate as the Thanksgiving turkey) makes a nice backdrop for the usual forced cheer of Christmas. 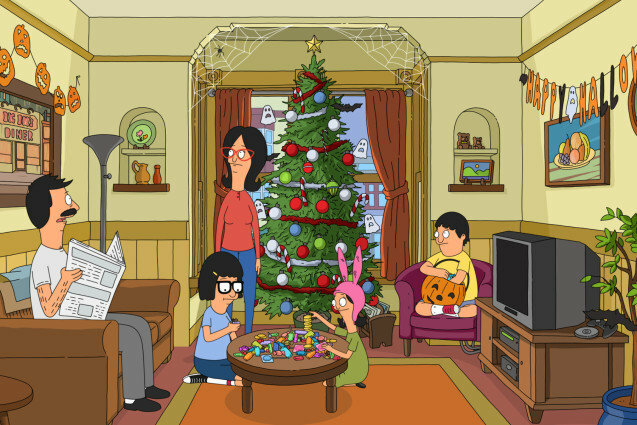 Tina: Bob and Tina have what seems like a double-meaning conversation about Louise, who still believes in Santa — and in kidnapping him — but turns out Tina had no idea what they were talking about. Her lack of guile is what makes her so flipping loveable. Louise: Louise’s plan to capture and kidnap Santa is great because it fails, yet is also well-made enough to trap Teddy when he comes over to turn off the still-cooking Christmas ham. The key is to use the weight of the fridge. Guest MVP: The sight gag of a candy cane truck somehow manages to be intimidating and dangerous for most of the episode, but as soon as the diminutive driver played by Bobcat Goldthwait hops out, it goes straight back to funny. Recurring Gags: Not many this week, but the seasonal opening credits were a nice touch. And this family has next to no respect for the driver, tickling his mustache, refusing to hide quietly like the Von Trapps, and jumping out of the car to run. Overall Assessment: It’s not the best holiday episode of Bob’s, but it’s definitely the most inspired idea for a Christmas episode in years. Rather than default to yet another It’s a Wonderful Life or Christmas Carol parody, using Duel as a jumping off point easily earns this a place in the pantheon.